Love deals? 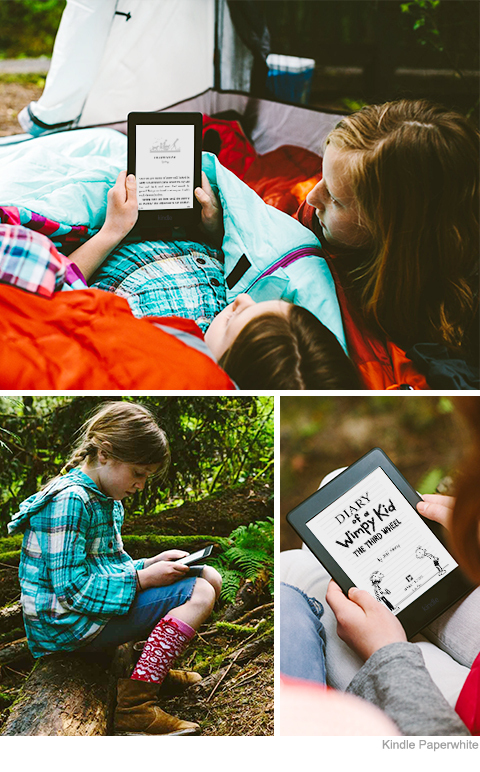 You'll receive special offers and sponsored lockscreens directly on your Kindle. 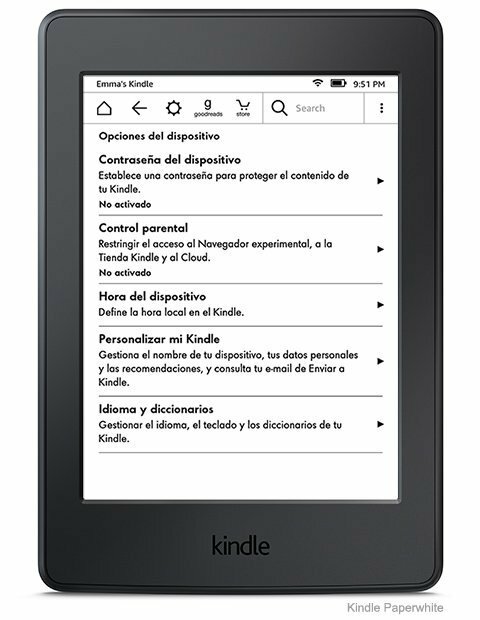 Offers display on the Kindle lockscreen and on the bottom of the home screen and library while not in use - they don't interrupt reading. 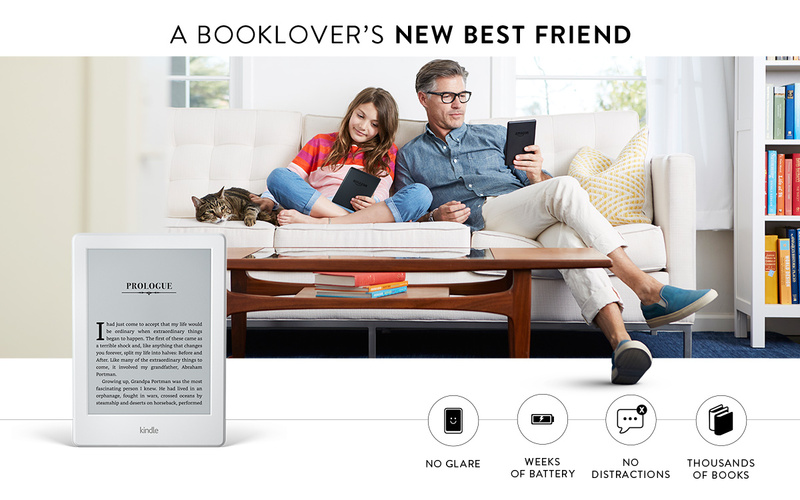 A booklover's new best friend Thin and light for one-handed reading The allâ€”new Kindle is 11% thinner and 16% lighter than the previous generation Kindle, making it easy and comfortable to hold in one hand. No glare in bright sunlight Unlike reflective tablet and smartphone screens, the high contrast touchscreen display eliminates glare in any settingâ€”even direct sunlight. 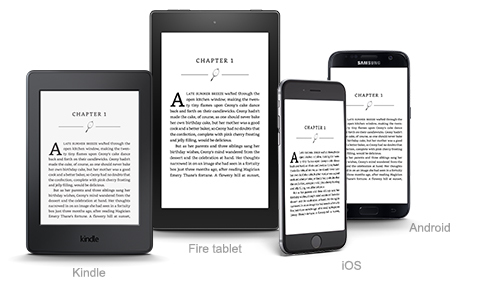 No eye strain, reads like real paper Kindle uses actual ink particles and proprietary, hand-built fonts to create crisp text similar to what you see in a physical book. The blacks and whites on the screen are uniform, improving text and image quality. 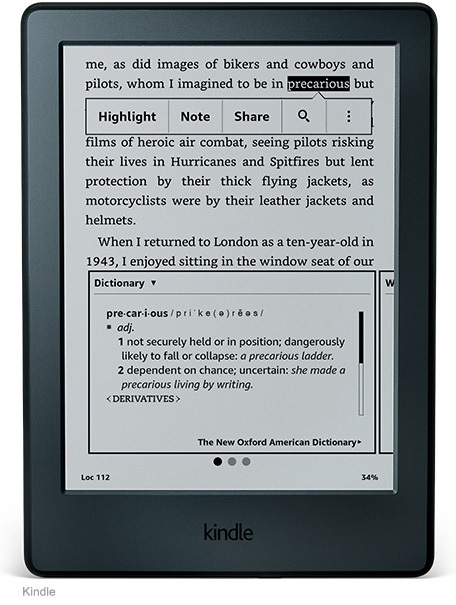 Battery lasts weeks, not hours Kindle doesnâ€™t need power to maintain a page of text, allowing you to read for weeks on a single charge. Unlike tablets, no blue light to disturb your sleep Recent studies have shown that evening exposure to blue light from devices with backlit screens like tablets and smartphones can suppress the bodyâ€™s production of melatonin, a naturally occurring hormone that helps the body fall asleep. 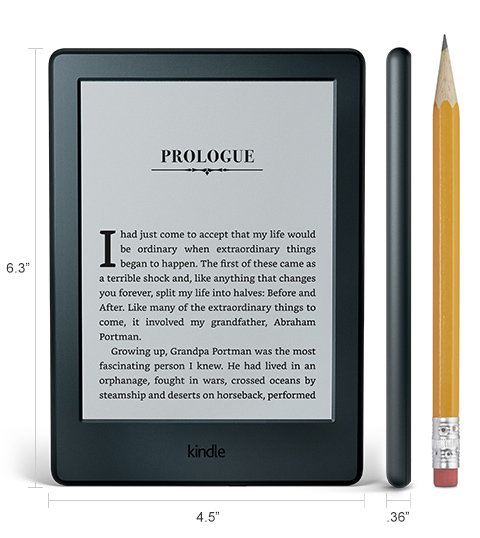 Because the Kindle display emits no light, you can read anytime without losing sleep. Thousands of books, no distractions Kindle is designed as a dedicated e-reader. Indulge your love of reading without interruptions like email alerts and push notifications. Read comfortably with one hand Lighter than a paperback, comfortably hold Kindle in one hand for those times when you can't put the book down. 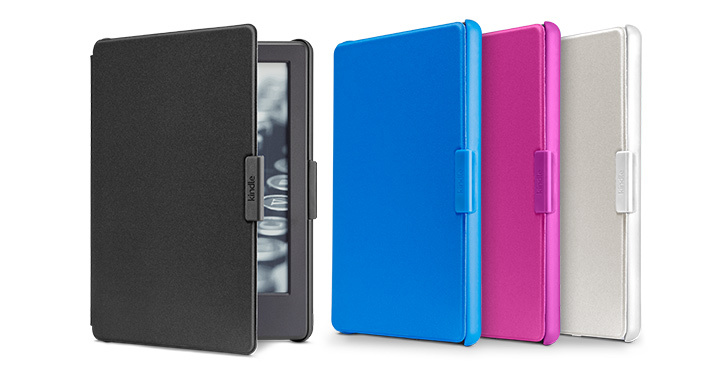 Lose yourself in a book By design, Kindle is purpose-built for reading and creates a sanctuary so you can lose yourself in a book. Unlike tablets and phones, Kindle doesn't distract you with social media, emails, and text messages. Take and share notes Add margin notes that you can edit, delete, or even export from your device to your computer. Share highlighted sections and meaningful quotes on Facebook, Twitter, and Goodreads, and see passages frequently highlighted by other Kindle readers. Look it up instantly without leaving your page Smart Lookup integrates entries from The New Oxford American Dictionary with information from X-Ray and Wikipedia, so you can access definitions, characters, settings, and more without losing your place. Read more challenging books Word Wise makes it easier to enjoy and quickly understand more challenging books. Short and simple definitions automatically appear above difficult words, so you can keep reading with fewer interruptions. 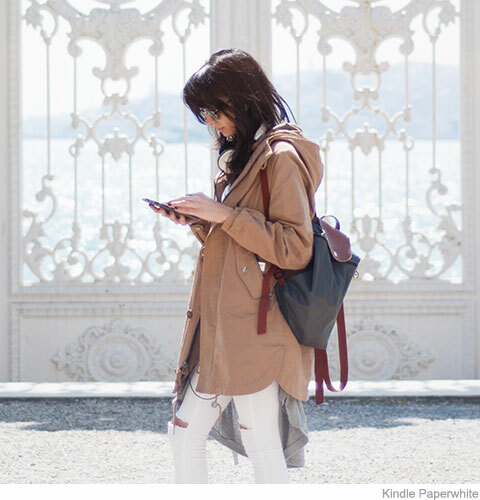 Tap on a word to bring up a simple card with definitions, synonyms, and more. Available on many popular English language titles. Build your vocabulary Words looked up in the dictionary are automatically added to Vocabulary Builder to expand your knowledge and reinforce retention. Swipe through your vocabulary words, quiz yourself with flashcards, and instantly see those words in context. Share your library With Family Library, you and your family can access and easily share not only your own Kindle books, but also books from the linked Amazon account of a spouse or partner. 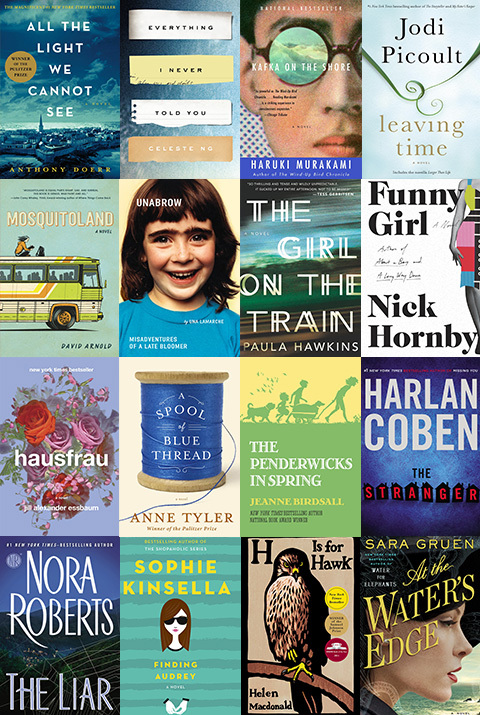 Lowest book prices, massive selection Over a million titles are priced at $2.99 or less. Over 2 million titles are $9.99 or less. Â Set goals and celebrate with achievement badges Kids can read books in a simple, fun, and safe environment designed specifically for them with Kindle FreeTime. Kids are rewarded with achievement badges when they reach their reading milestones. A progress report keeps parents updated on total time spent reading, number of words looked up, badges earned, and books read.